Port Blair, July 14: The Lt Governor, Lt Gen (Retd) A K Singh, PVSM, AVSM, SM, VSM, during his morning walk, paid a surprise visit to Netaji Stadium and inspected the facilities such as Gymnasium, Billiards and the Badminton court. The LG has noted that the facilities in these sports complexes are not up to the mark and directed the Sports Directorate to improve the facilities there including a facelift to the entire sports complex. All these works are to be completed by the 1st of October 2013, the LG ordered. The Port Blair Municipal Council has also been asked to put up a Comprehensive plan to develop the Marina front further including the feasibility of reactivating the sea pool, damaged during the tsunami. LG Visits Sippighat Farm: The Lt Governor also visited the Organic Horticulture Farm, Sippighat, South Andaman today and took a round of the farm. He was apprised of the activities being carried out there and also interacted with the officials, members of the ‘Sangarsh’, women Self-Help Group, who had set-up their stall in the farm and make a living by selling agriculture produce to the visitors and tourists. The Lt Governor has complimented the staff for their good work and urged them to continue to put in their hard work and also ensure that the benefits reach out to the farmers across the islands. 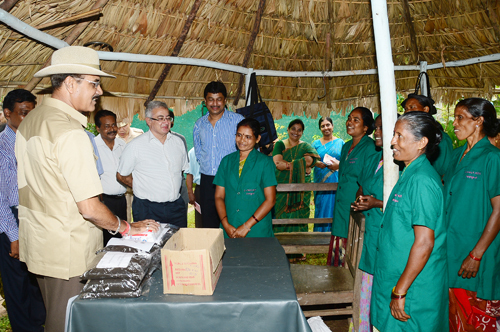 The Chief Secretary, Shri Anand Prakash and officers of the Agriculture Department were present.